Sweet Surrender Bake House created a unique contest for St. Patrick’s Day. 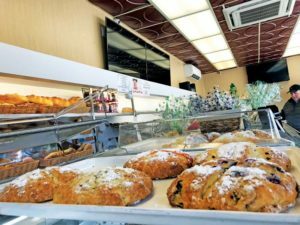 “It’s the best bakery on Long Island,” one customer shouted before leaving Sweet Surrender Bake House. This customer isn’t kidding. 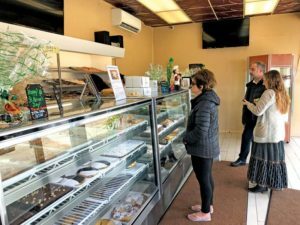 The Levittown bakery, known for its signature Crannoli—a donut, croissant, Crannoli hybrid—took social media by storm just in time for St. Patrick’s Day. Creative thinking is what this bakery strives on. But this time around, they wanted to see what other people can cook up. The self-labeled “two Greek cousins,” Kyrillidis and Tanya Salagiannis, mapped out a contest that would get not only Levittowners involved, but people across Long Island. The goal was to have some fun, encouraging people to share pictures of Sweet Surrender’s delicious treats on Facebook and Instagram. In doing so, they came up with one of the most unique items you’d ever see in a bakery. 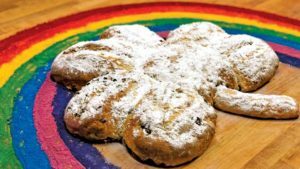 Salagiannis combined each of Sweet Surrender’s seven different types of Irish soda bread, forming them into the shape of a shamrock, a major Irish symbol. Customers had to either comment on the bakery’s Facebook page or use #SweetSurrenderLucky7 to enter for a chance to win this one-of-a-kind soda bread. Irish soda bread first became popular in the mid-1880s, serving as a quick and cheaper way to make food. Dozens of people entered the contest, but only three would win. It was up to the luck of the Irish. The names were written on pieces of paper and put into a bowl, making it completely random. Besides the three lucky winners, Sweet Surrender Bake House also donated one of the seven-in-one Irish soda breads to the American Legion Post 1711 Levittown during the March 16’s annual St. Patrick’s Day party. This isn’t the only contest that Sweet Surrender has, though. Want to know how to make the soda bread? Eh, not so fast. “That, you would have to ask Tanya, or you’d have to buy the bakery,” Kyrillidis joked. Unfortunately, the shamrock Irish soda bread isn’t for sale. Instead, you can purchase Sweet Surrender’s different flavors.